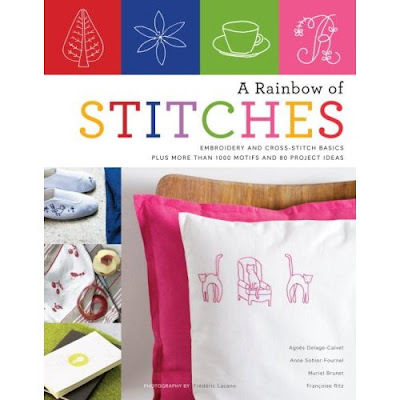 Have you entered the Rainbow of Stitches contest yet? There's still a wee bit of time! So get out those hoops and needles! I want to just throw this out there: for the purpose of the contest would you make sure your entries are tagged properly? Don't forget, you have until midnight 31st of May to enter. The contest pool will be closed at midnight Honolulu time so everyone has a chance to add their entries. Check this blog post to figure out when that is in your own time zone. 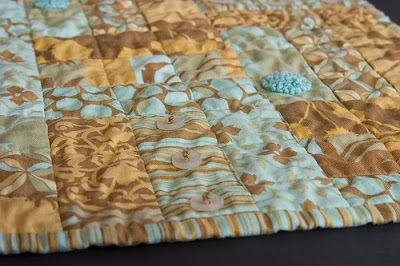 I love this new summery pattern called Summer Flowers from Carina of Polka & Bloom. 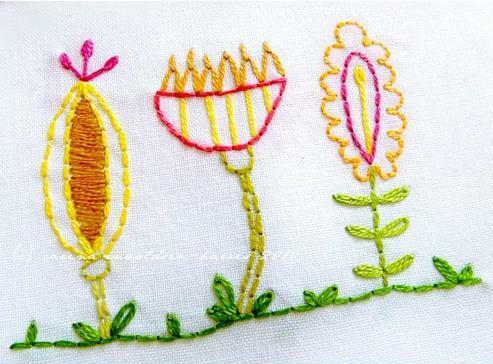 I particularly like the colours she's used, as she says in her blog, they remind her of an ice lolly, perfect for a cooling spot of embroidery! WIP: shisha sampler, originally uploaded by Erratic Needle. Shisha embroidery is one thing I have never tried, but looking at this beautiful sampler I think I may just have to! Isn't it lovely? 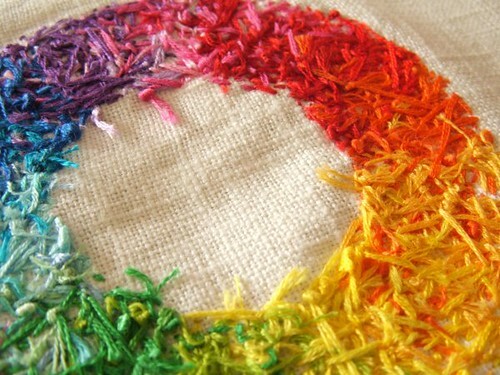 I really like the combination of all the different stitches and the colours. So fresh! 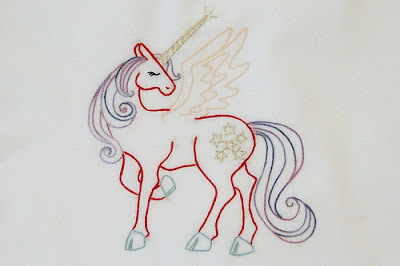 Rainbow of Stitches contest - less than a week left! Right! There are 5-6 days (depending on your timezone!) left of the Rainbow of Stitches Contest! 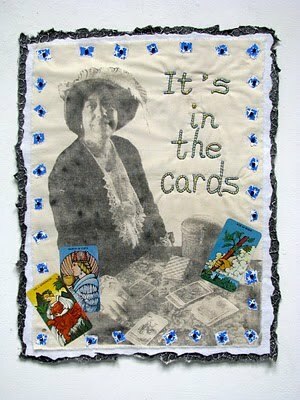 Are you busy stitching away? If you haven't started yet, I thought I'd just point out some stats on what has been submitted so far. As you probably know, entries have to have a dominant colour, as you can see in the image above. 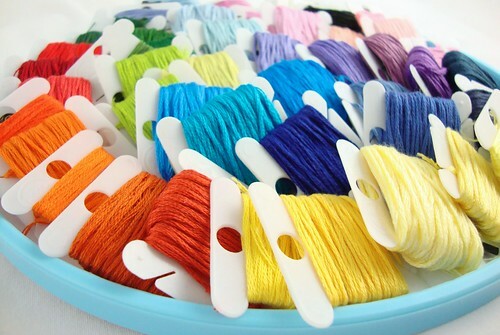 If you haven't submitted anything yet, here's a tip: do your stitching in one of the colours that aren't so popular, like yellow, violet/purple or orange! Don't forget, May 31st is the last day to submit! Edit: The contest ends when every timezone has passed from May 31st to June 1st. Anything else would be unfair, right? ;-) To find out when that is, please follow this link to timeanddate.com and put Honolulu in the top spot and your own timezone in the bottom one. Knotty Weeds, originally uploaded by JammySage. 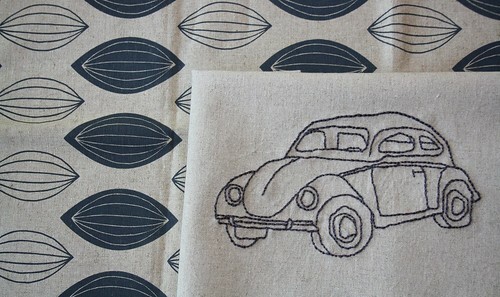 I love (love, love) when stitches are used and shown off to their very best. 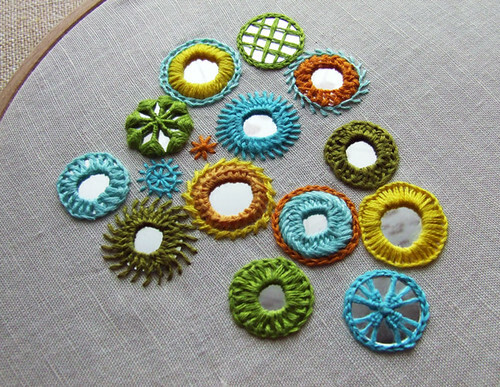 Different stitches are so beautiful in themselves and it is great to see pieces that let the stitches play the leading role in stead of being the supporting act. This is an excellent example of that. Just an amazing Frenched Bear by Bustle & Sew. I love a coloured piece. 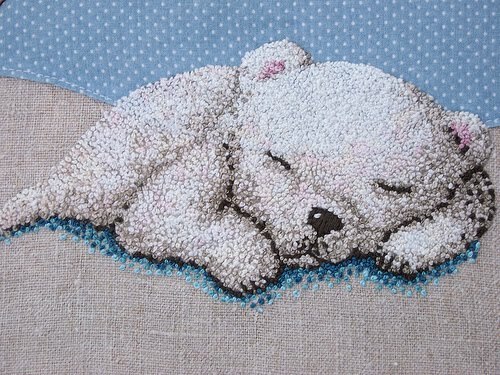 I've made a little gallery of lovely filled stitcheries recently added to the flickr group & I thought you might enjoy it. My fillers of choice are chain stitch & french knots. I'm terrible at satin stitch & not much better at long & short. I think it's got something to do with my persistent refusal to use a hoop. What's your filler of choice? There have been two great patterns recently released using fantastic embroidered fur. 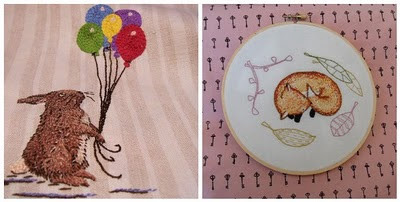 Both .pdf patterns; Bunny and Balloons by Bustle and Sew and Forty Winks Fox by Follow the White Bunny, come with detailed how-tos to embroider the fur. I think they both look very sweet. I came across Art in Stitches yesterday and was completely blown away. Susan Lenz is amazing. Her latest art piece is called "Decisions" and she is asking real people about their decision and stitching up their portrait for the world to see. Be prepared for a mix range of emotions from laughing to tears. 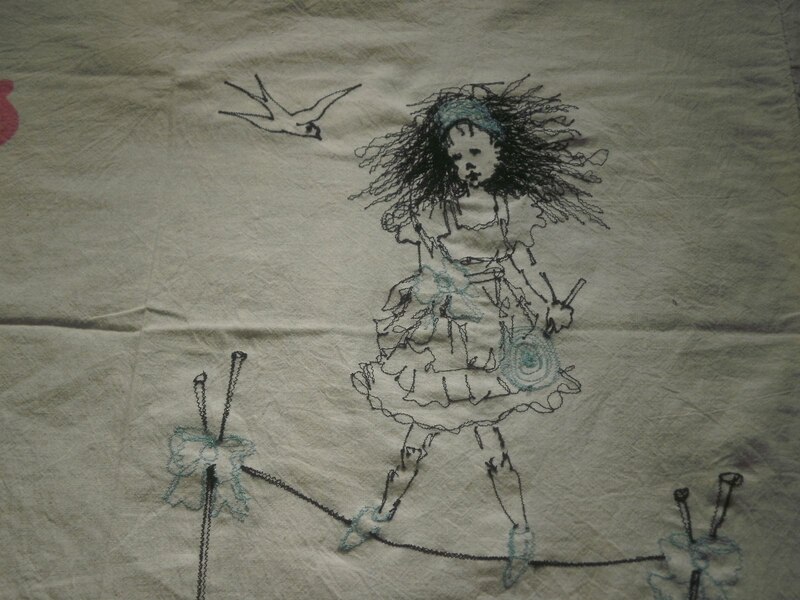 The stories, the stitching and the images will move you. I don't watch Lost, but I'm loving this. Love how so many of you are inspired by TV shows. Makes me feel less guilty for watching so many. Surprise Prize for the Rainbow of Stitches Contest! Let me guess, you like embroidery floss? 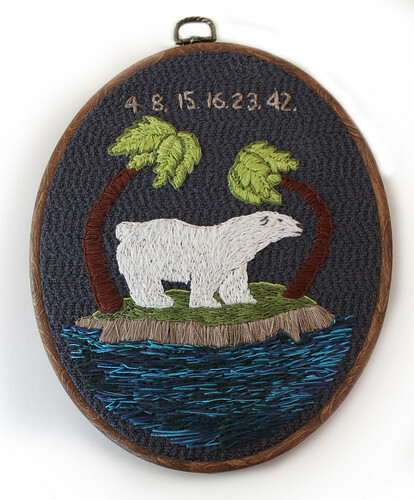 And, if you're anything like the rest of us, you've probably stared at the DMC embroidery floss display, wondering what it might be like to own every single color. Well, the winner of this contest will wonder no more. Wanna know why? 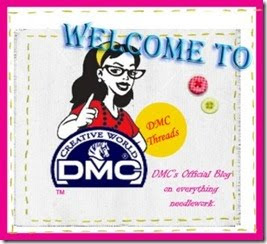 Our winner will receive a complete set of DMC embroidery floss. 454 colors. One person. Every color of the rainbow. And then some. Have you fainted yet? I almost did. Thanks to the wonderful peeps at DMC for contributing this amazing prize to our contest! Oh, and look - their badge is even looking a little Feeling Stitchy-inspired, as a tie-in to our contest! Our original banner design is by Kirsty Neale, who won our 2008 banner contest. Thanks, DMC, for being so generous and supporting this community of stitchers! And to all of you - have you entered the contest yet? If not, what are you waiting for? Because, if nobody wins this prize, I might have to keep it myself. Ha ha, I kid, I kid. Maybe. Do you use Flickr to its full potential? I don't - I'm shocking with tags. I rarely (if ever) use them at all. Am I short changing fellow stitchers? My search for stumpwork examples this week left me wondering if other people are as slack as me. 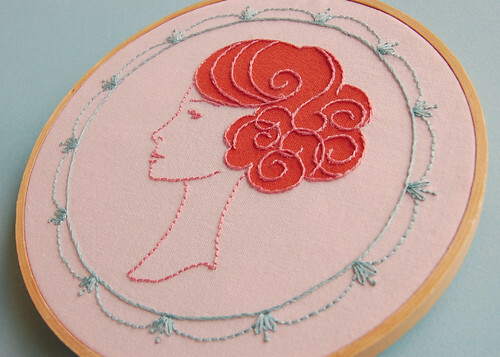 Has stumpwork flown under the modern embroiderer's radar? Maybe...maybe not. Alien Ted didn't let me down. 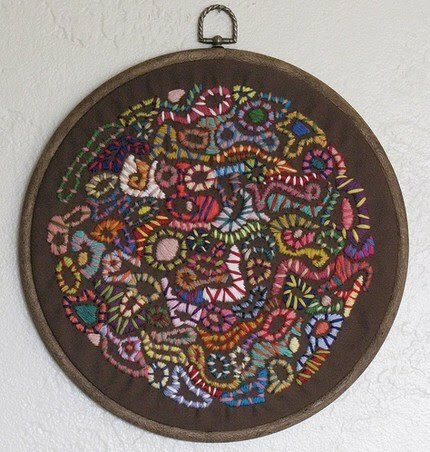 Very cool stumpwork. 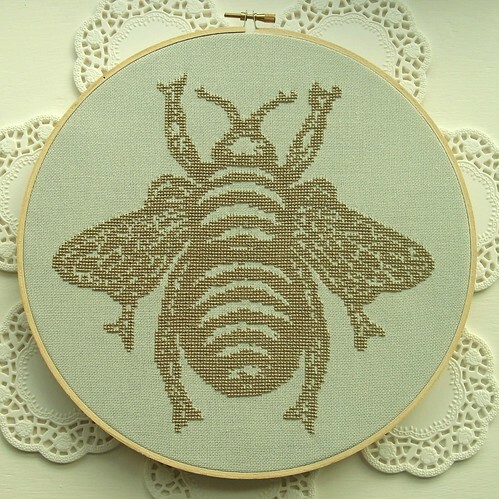 What Delilah Did has recently opened her own pattern shop and I love her bee design. This looks quite complex but I can imagine the feeling of satisfaction once this is stitched up. It looks amazing in gold and as lovely as this photo is, I bet it doesn't do the gold thread justice. For further insect love check out this vintage pattern in Flickr's Hoop Love Vintage Transfer pool. Stitching n Junk - The Official Mr X Stitch Podcast! Hi there everyone! 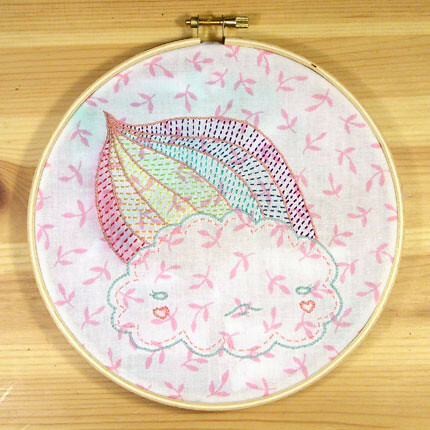 Just a quick note to let you know about the latest stitchy endeavor over at Mr X Stitch - we've got a podcast! Called Stitching n Junk! Hurrah! In the first episode Mr X Stitch and I chat about stitching and have a lovely conversation with Julie Jackson of Subversive Cross Stitch fame. It was a pretty amazing moment for me, I promise you. :) If you'd like to listen in, check out the podcast here. You can also subscribe on iTunes by clicking here. We'd love for you to listen and join in on our conversation as well! I've always used cross stitch to express myself in a way that I've never been able to do before. I'm not what I would call an artistic person. I can't draw - in fact I can barely write legibly - but there is something about this medium that just works for me. Most of the time I use it to make jokes, but more recently I was grateful to use it in a more therapeutic way. This is something Alexandra J Walters calls Self-Guided Art Therapy, and you can see all kinds of examples of it at her blog of the same name. This is just one of the many amazing pieces Alexandra has shared there. Each one has meaning. Each one has its own story that work together to tell Alex's story, whether it is a military themed piece like the above, or an ode to and everyday object like the spoon below. I could try to tell you more about her and what motivates her, but Penny Nickels recent interview with her is probably the best way to gain that insight. If you have ever dabbled in self-guided art therapy and would like to share your work in a supportive environment, I definitely recommend checking out Alexandra's blog for details on how to submit a project. You'll be glad you did. 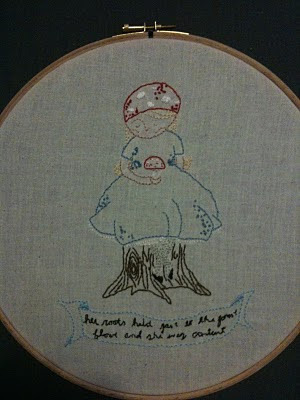 I had such fun stitching this one up! I think it looks so delicate and sweet. The pattern is called Into The Wood: Little Redcap the Youngest and is by Cathy Gaubert. I love the text at the bottom of the piece, which reads 'her roots held fast to the forest floor and she was content'. 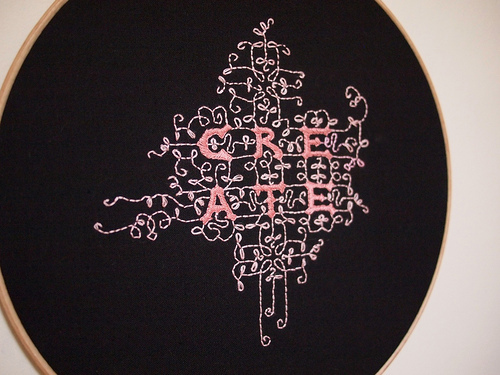 This embroidery will stay in it's hoop and have pride of place on my bedroom wall but I also have a feeling I'll be stitching it up again as I think it would also look great on a simple white or blue knee length skirt, but oh this could look good on so many things! 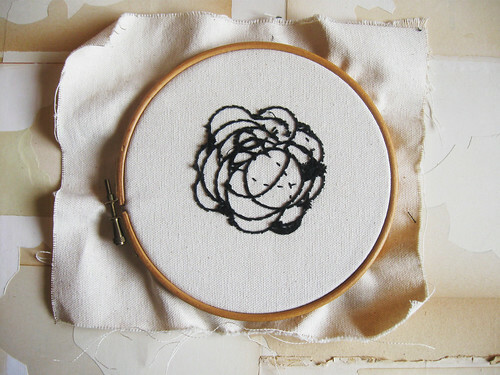 My take on blackwork embroidery: 1, originally uploaded by JammySage. Isn't this lovely? Definitely goes to show that using just one colour doesn't have to be boring but can be rather spectacular. Very inspiring, I think! Instead of just giving it away randomly, we decided to celebrate the rainbow of colors and create a contest you can enter in 9 different categories! We'll select a winner in each of the 9 categories - which means... 9 prizes! Each category pick will get a sweet prize that could include: embroidery floss, pdf patterns, vintage patterns, fat quarters, blank tea towels or pillowcases. Also, each of the 9 winners will be featured here on Feeling Stitchy with a brief interview. Want to enter? It's easy! Join the Rainbow of Stitches Contest Group, and add your entries. You can enter in as many categories, as many times as you like! 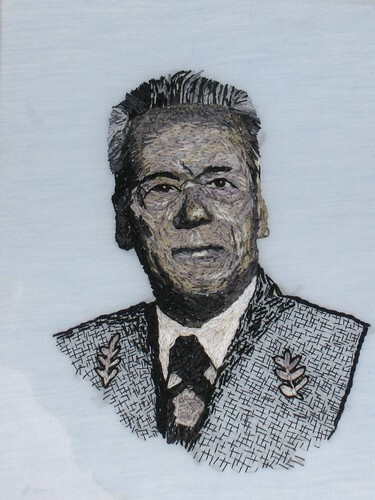 Entries must be hand-embroidered by you. 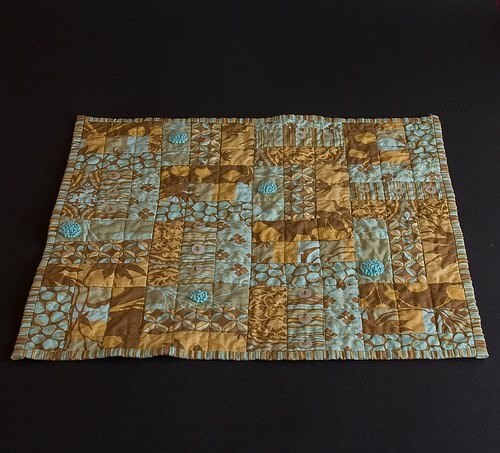 Can be any size and on anything - handkerchief, pillowcase, clothing, quilt, pillow, atc, etc. Works don't have to be all one color, but they should have one dominant color or theme. Have fun with it! 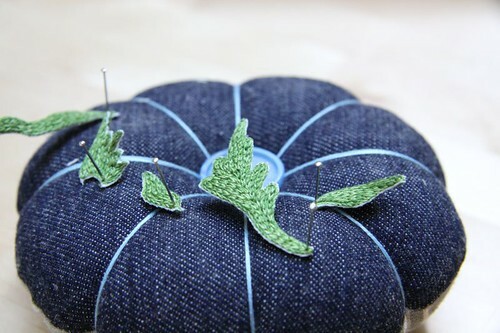 Are you ready to get stitching? Can't wait to see what you create!!! My stitching life just wouldn't be the same without it. It's a "must have" for the stitching kit. I always buy my "magic disolving stuff" from Bustle & Bows in Melbourne. They know what I mean when I ask for that but you might want to call it Aquasol or water soluble plastic if you're asking for it in store. Do you use this product or maybe you have some other favourite for embroidery on dark fabric? Do share. 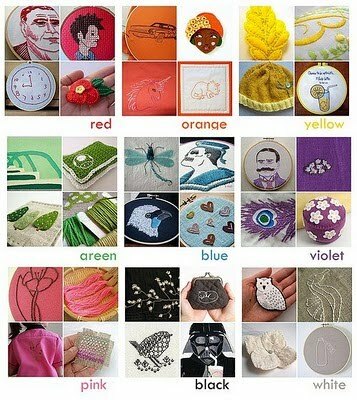 This is not only useful for embroidery but I imagine many other crafty pursuits. I saw a similar product used to create a super fluffy critter on a blanket recently.